Union Bay Trustee introduces her new blog. Just received this email from Trustee Susanna Kaljur introducing her new blog. Since she has been muzzled by the bullies on this board, preventing her from speaking at meetings, she has found a platform to engage landowners and residents of Union Bay. As a landowner and as trustee in Union Bay I have found my voice silenced unfairly and without merit or basis in proper procedure. I have therefore begun my own blog which I am pleased to introduce today. This blog represents my opinions which are based on facts, evidence and personal experience. I am not speaking on behalf of Union Bay Improvement District of which I am an elected Trustee. I am expressing my own concerns about our drinking water, watershed protection and governance irregularities. All these are matters of public interest. That’s you. You have the right to be informed. 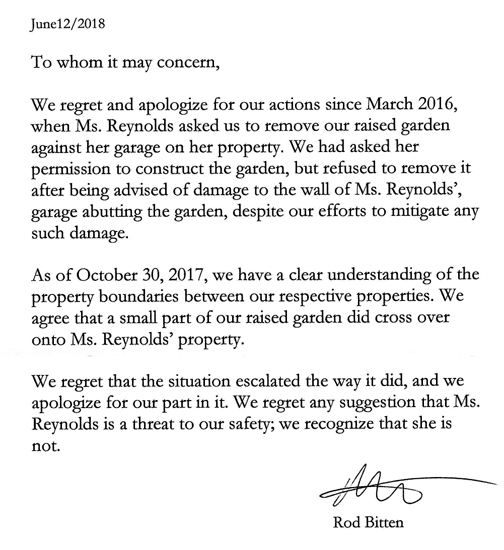 This apology from Rodney Bitten along with money to fix my garage and pay my great lawyer – Jason Gratl – is the result of the false police reports made by Rodney Bitten. Alan de Jersey does not approve of this post. Kensington Island Properties aka KIP Costanza, 34083 Yukon Inc.
More old videos of the Union Bay Improvement District monthly meetings, etc. Old Videos of the Union Bay Improvement District monthly meetings, etc. More Gong Show actions by Union Bay Improvement District. Unlawful actions, secrecy, lies, misinformation and acting as public relations for KIP. Vote for progress. UBID can’t/won’t provide answers but they can do public relations for KIP aka Union Bay Estates? We are locked out. No information. Is the board functioning as a legal board or is it still a conspiracy of four plus one? Dictatorship or democracy? Why are landowners kept in the dark by Union Bay Improvement District? Good turnout at the advance poll – let’s make this a record breaking election. For Goldie and my good friend Vince. “Because we’re dealing with government timelines don’t matter,” said McMahon. Remember George Costanza on the Seinfeld show? When all was said and done, poor George Costanza was just a loser screwing up everything he touched. Have been following the antics beginning with Weldwood in 1996 and now 23 years later it’s obvious KIP deserves to be referred to as KIP Costanza. Loser. If you're considering renting the Union Bay Community Club Hall for a function, there are a few things you should consider before signing that rental form. If a Union Bay Community Club Member doesn't like you or your event and disrupts your event possibly causing bodily harm; having the event shut down - it is your responsibility. Not the Union Bay Community Club.